I have always loved Autumn and Winter and October is my favourite month of all. I like everything about it, the mists, the leaves glowing and fading and the ghostly forms of the trees beginning to emerge. 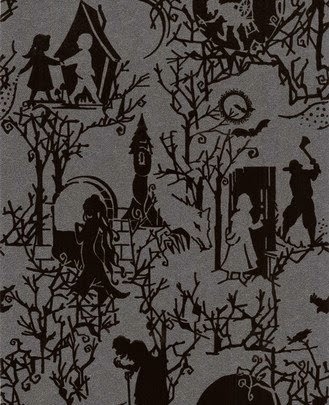 Most of all I love Halloween. 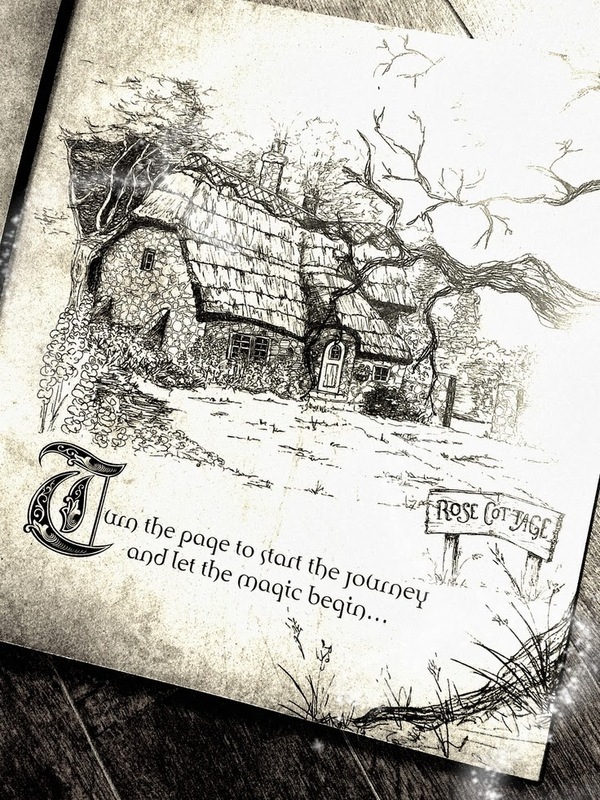 In keeping with the month of ghost stories, hauntings, witches and Trick or Treat I am going to be posting about the origins of things connected to this magical month and sharing some items and ideas, new and old, which will bring a touch of fun and enchantment to your home. 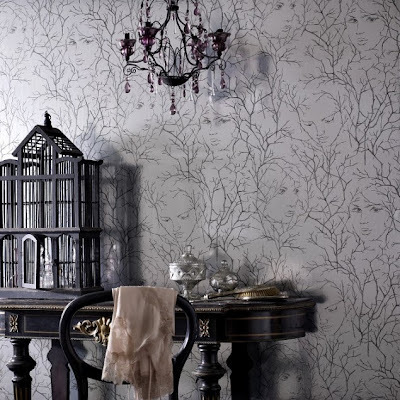 Graham and Brown recently produced a fabulous collection of wallpapers named 'Spellbound'. 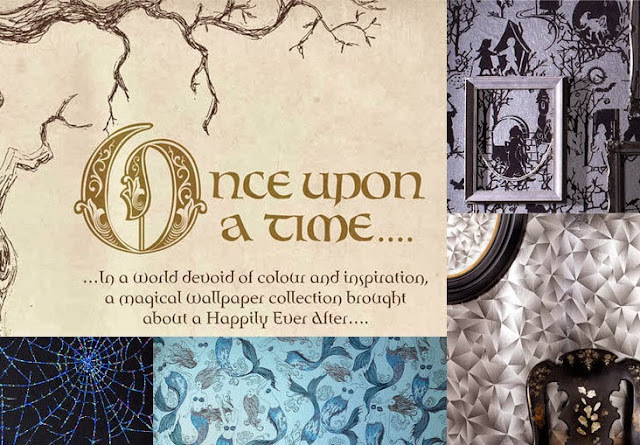 There is something for every kind of fairy tale here from the rose cottage to the gothic castle on the Rhine. It is magical. Most magical. 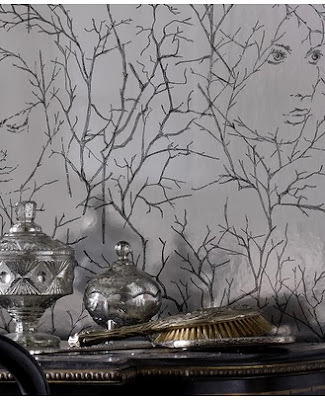 There is a paper for every room in the house and they are wonderful inside cupboards and drawers too. Although it was VERY hard to chose, I could not resist having three of these! 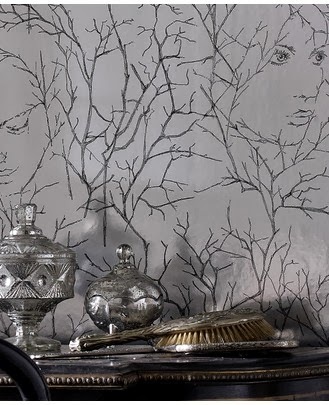 These are my favourites in the collection, but you can see the full collection on their own website, the link is at the bottom of this post. 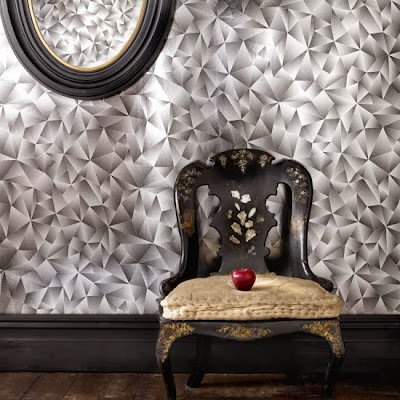 Graham and Brown have used magnificent room settings to show these papers off to their very best. Well done to their stylist! The black painted woodwork, the empty picture frame, the inlaid paper mache chair and last but certainly not least - the poisoned apple. So very clever. 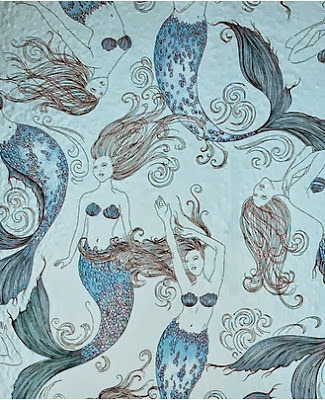 'Mermaids' - the perfect wallpaper for a bathroom! 'Goddess' and another stunning setting. This monochrome paper would go with any colour and add a touch of intrigue. It has a woodsy vibe to it and they have highlighted this with the birdcage. The black and gold dressing table is fit for any Goddess and the glass and silver complete the look. 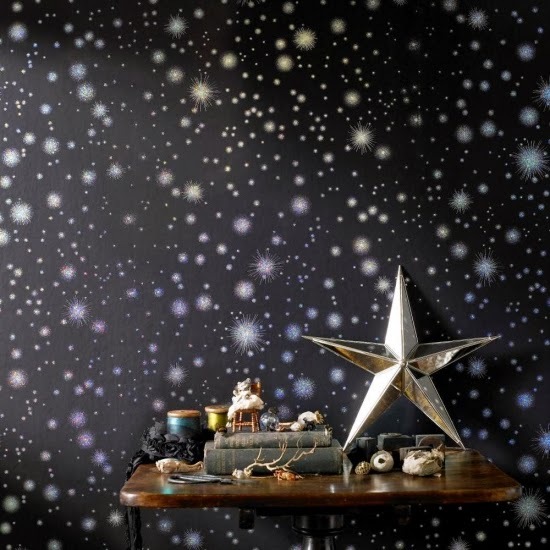 This is 'Stardust', a dramatic starry cosmos. The items in this setting have been carefully chosen and make me wonder what significance each one has. Old books, shiny threads, bits of shell, a branch from a tree or coral? Is that a little mouse perched in the tiny chair? 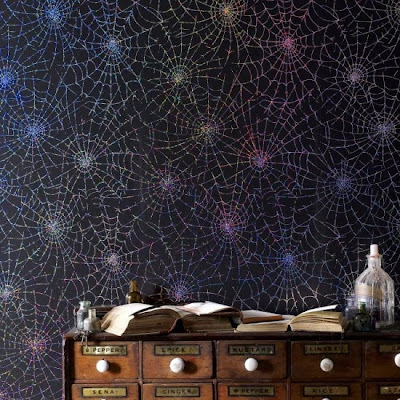 This one is not for those with spider phobias. It is gorgeous though and glimmers in the night. 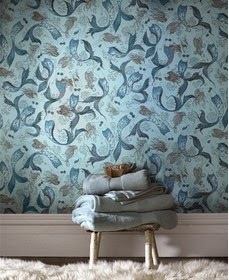 We are being brave and using it on a feature wall in a bedroom. 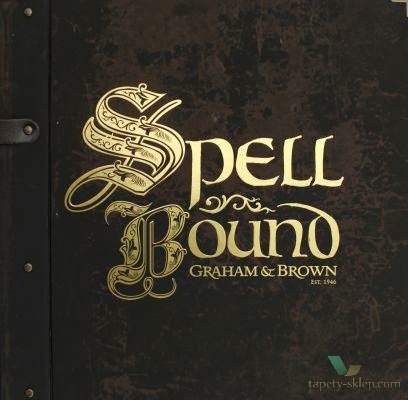 View the full Graham and Brown Spellbound collection on their own website. But be warned - you will be TEMPTED! October has been such a lovely month . I do always enjoy October to the fullest and even still this year it has been just absolutely gorgeous. At the moment I am sitting out in the sun with my laptop, with dragonflies darting to and fro, chickens chortling at my feet, a few feet away ponies grazing on the beautiful but dwindling grass. Many a flower still in bloom here on the farm ,even the lovely dainty morning glories and cosmos still are sharing their colors along with the hardy mums (we have not gotten a frost here yet) . We have Fall foliage as well, and golden leaves are rustling in the breeze and wafting gently through the air . A gorgeous October day indeed ! The stardust is my favorite, by far. I can see that in my house. 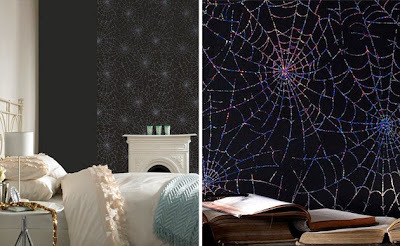 These are so cool--I love them, especially stardust and the cobwebs. Also I love your header--such a great group of pictures. Fab papers. 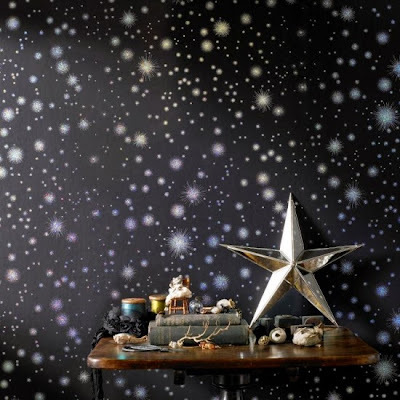 I love the stars. I would love to do inside cupboards with these. I love the cowwebs (for a tiny piece of wall). Maybe you'll like the photo of fogs over English evening meadow on my last post (have beautiful cowwebs full of morning dew too, but there is always a limit to the number of photos one wants to post). Thank you to everyone for taking the time to leave us comments - I am glad that you enjoyed the post and the magical Spellbound collection by Graham and Brown.